Softube aren't breaking new ground here, but this is a solid addition to their processor portfolio. Silky smooth tones. Easy to use. Works in many mix situations. A useful addition to your mixing toolbox. It's yet another Pultec EQ! Here we have yet another Pultec-style EQ emulation; to be more accurate, it's an emulation of a modernised copy of the original Pultec EQP-1A. The venerable EQP-1A has been emulated in software many times over the years - we count at least ten plug-in versions currently available, from a myriad of developers. Now Softube have turned their hardware modelling skills to the task, and along with some help from Tube-Tech, created the Tube-Tech PE 1C EQ plug-in. This collaboration marks the second time the two companies have teamed up, their first outing being the Tube-Tech CL 1B compressor plug-in. Anyone familiar with Pultec-style EQs will be instantly at home here. Most such emulations look more or less the same, but the PE 1C differs slightly in that it replicates the Tube-Tech hardware rather than an original Pultec box. The unit's controls look very three-dimensional and realistic - not essential but nice nonetheless. The PE 1C design is a passive tube equaliser, so its controls are pretty easy to get to grips with. It works in three distinct sections. The low-frequency section has overlapping boost and attenuation shelves, as well as a Frequency Selector knob adjustable between 20, 30, 60 and 100Hz. The other two parts pertain to upper frequencies. The boost section is a peaking EQ with knobs for Bandwidth, Boost and Frequency, the latter being adjustable in fixed steps between 1 and 16kHz. Finally, there's the treble shelf with controls for Attenuation and Frequency (5, 10 or 20kHz). There's also an output gain control. This wasn't in the original design but is convenient as the PE 1C can alter the signal level. The crucial thing about the PE 1C (and other Pultec-esque EQs) is the way in which the controls interact, which is quite different to standard parametric EQs. In the low-end section, the Attenuation dial works on a slightly higher frequency to the Boost dial, which results in a very natural and musical 'enhancement' when using the Cut and Boost controls together. The high-frequency sections can work in tandem with each other, too, as you can use the boost to bring out a certain frequency spot, then bring the entire treble down a tad if things are now too bright. The PE 1C works great on bass, vocals, kick drums and even on a mix buss. 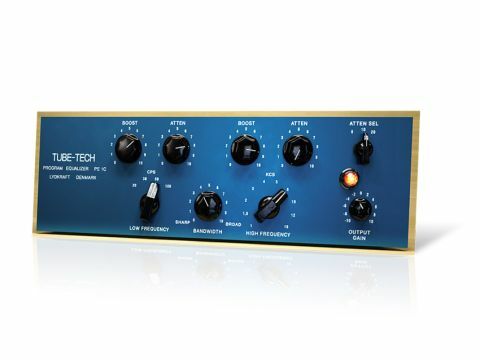 Comparing it to other EQP-1A emulations is slightly confusing; the Tube-Tech PE 1C is said to give the sound of a "brand new" Pultec EQP-1A, and it does seem a tad less gnarly than, say, IK Multimedia's Pultec emulation. The difference is subtle, though, and you can still drive the input for a warmer sound. Sonically, think silky-smooth highs and warm thick lows, like, er, audio chocolate. The PE 1C isn't a precision tool but rather a 'feel' EQ that can be used intuitively. If you're in the market for a Pultec-style EQ, this one comes highly recommended.